In yesterday’s post about Spider-Man Tangled Web #21, I tipped off today’s entry by saying for Christmas Day I would discuss a holiday-themed Spider-Man comic that I thought didn’t hold up as a good representation of the genre. So without further ado, I bring you the forgettable mid-90s submission, “’Twas the Night Before X-Man,” aka, Amazing Spider-Man #420, by the legendary Tom DeFalco, with pencils from former X-Men artist Steve Skroce. Longtime readers of Chasing Amazing will note that this issue is one of many that was published during the “dark ages” of my Spider-Man fandom. Everything post-Maximum Clonage and pre-J. Michael Straczynski/John Romita Jr. is representative of my “lost vacation” from comics – when the industry’s relentless gimmicky-ness beat me into submission and drove me away until JMS put the focus back on quality characterization and compelling stories (“Sins Past” and “One More Day,” of course not included). I know there are some fans/readers out there who actually think this period of Spider-Man comics was a bright spot for the character – including one specific reader who I respect a ton – but it’s hard for me talk about any of these issues without my negative bias shining through. And considering how rarely any of these storylines are referenced or talked about today (outside of those hyper niche sites like mine), I think the argument could be made that my opinion, in this one instance, is on the right side of history. ASM #420 is far from the worst Spider-Man comic in the character’s history, but it’s still a worthwhile example of why this was such a crummy period for not only Spidey fans, but comic book fans. Even as the industry started to move away from the chromium and foil covers as a way to boost sales, it still deployed its share of gimmicks that affected the story in a negative way. 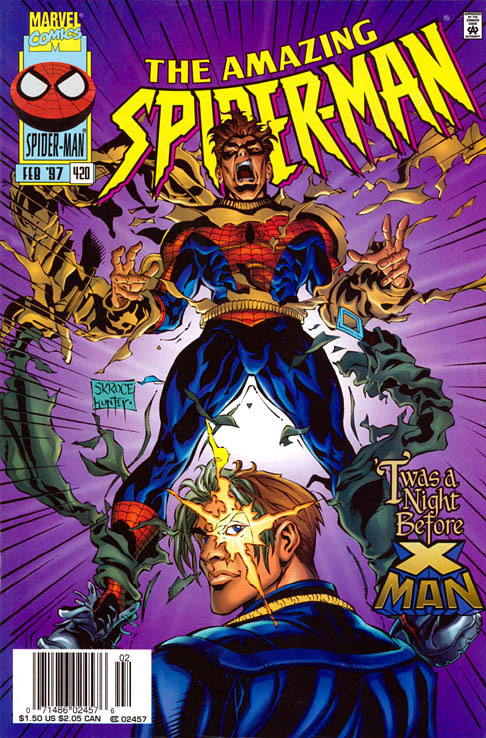 ASM #420 marks a pairing that nobody was clamoring for – Spider-Man and the mutant psychic X-Man, aka Nate Grey, a byproduct of all the mutant-mania of the 1990s. 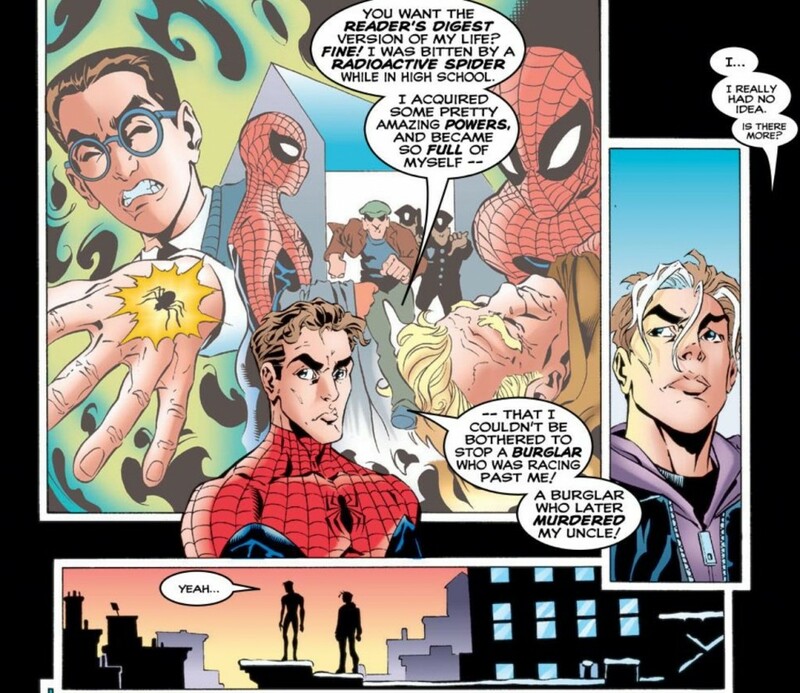 Throughout this story, Peter Parker and Nate are portrayed as being friendly, despite the fact that X-Man continues to invade Peter’s private thoughts about some horrible tragedies that have impacted his life. Also, while I can’t speak too knowledgeably about this point because I’m not an X-Men reader, but apparently Nate is considered an unlikeable jerk because he can’t control his psychic abilities. From what I understand, Marvel’s then-editor-in-chief Bob Harras was big on making the Marvel Universe a more “intimate” place, which would explain the odd pairing. Additionally, Skroce, who was ASM’s on-again/off-again artist at the time, created X-Man during the much more revered “Age of Apocalypse” storyline. Skroce is certainly an acquired taste. I felt a bit embarrassed when I appeared on the “Matt and Brett Love Comics” podcast earlier this year and one of the co-hosts, Brett White, a blogger and comic book fan I respect enormously, was singing the praises of Skroce (it should be noted that Brett is also one of the biggest X-Men fans I’ve ever met). I slammed Skroce’s artwork when I covered ASM #418 some time back. 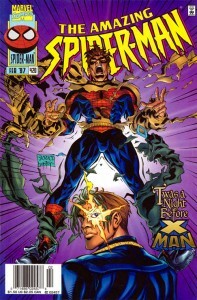 I think this issue looks much better, but Skroce still reads to me like just another overly-stylized 90s artist. And I’ve long found that the bulk of those guys (Todd McFarlane, Jim Lee, Rob Liefeld, Erik Larsen, Mike Deodato) either scratch a certain itch with a specific reader and “work” or don’t. There really is no in-between. 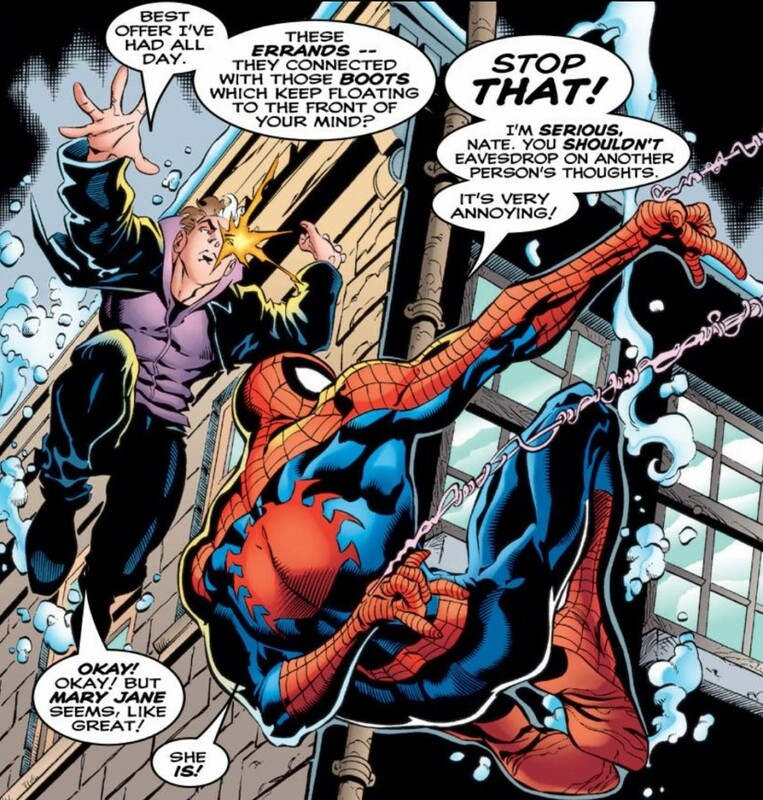 With that in mind, Skroce’s art doesn’t “work” for me on Spider-Man. As for the comic’s story, we all know I love DeFalco enough to always refer to him as being “legendary,” but I don’t think I would point to this issue or any others from this period as great examples of his scripting abilities. ASM #420 awkwardly frames the past year of Parker-family tragedies (the death of Aunt May, and the miscarriage/possible Norman Osborn orchestrated kidnapping of Peter and MJ’s baby) around the holiday season. 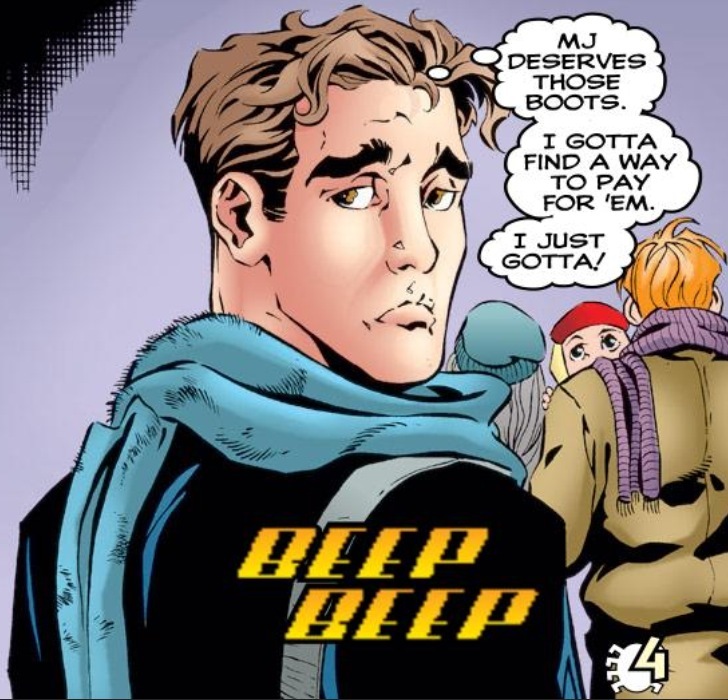 All Peter wants to do is buy Mary Jane a pair of boots, but of course he has no money and is going to have to find some extra assignments from J. Jonah Jameson to afford them. And that’s where Nate and his psychic abilities come in. I guess I can see merit in doing an issue that’s reflective on all of the bad stuff that’s happened to Peter and MJ over the past year and the Christmas season is certainly as good of a time as any to be thoughtful and pensive about life, but this story still comes across as forced and strained. Because it’s a holiday issue, DeFalco doesn’t dive too deep into Peter’s torment, as to not ruin the mood. Meanwhile, I find it very odd that the miscarriage is referenced in this issue, but not the fact that Peter’s clone was reduced to a pile of goo in the “Revelations” storyline. Those events all happened within the same arc. 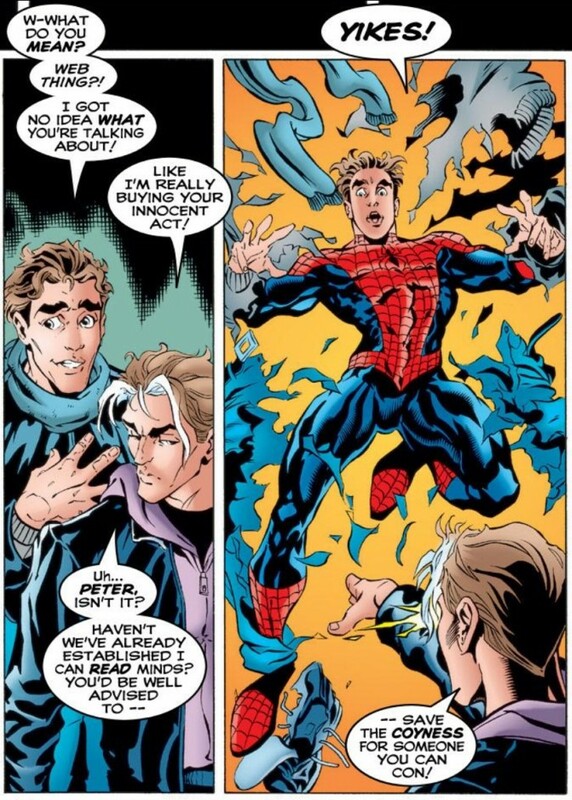 Then there’s the emotionally cheap ending of having Nate at the Parker dinner table, who then in turn uses his powers to “allow” Peter to dream about Aunt May that night as a “thank you” for his hospitality. I’m as much of a sucker for a good Peter/Aunt May moment as anyone as my recent reviews of “Spider-Man: Frost” demonstrate, but there is something about the ASM #420 scene that comes across as maudlin and heavy handed. Perhaps it’s just my general dissatisfaction with this era of Spider-Man comics that’s influencing those sentiments. So now that I’ve officially ruined your Christmas day with this mid-90s version of walk down memory lane, let me say officially (since yesterday was just Christmas eve) that I hope everyone has a happy and safe holiday! I quite like this issue myself, but that might just be my fondness for Nate Grey.